Barnet's supplier payments are out for October and as ever they make interesting reading. Yet again Capita are receiving significant payments even though they have had massive advance payments. In the audit report published in September the External Auditor noted that Barnet had made £44 million of prepayments on the CSG contract. On the Re contract Barnet agreed in June to make a pre payment of £16 million in return for a discount. With such a large pre payment balance it then comes as a surprise that in October Barnet paid £1.71 million on the CSG contract and £1.24 million on the Re contract. Set out below is the latest tally on the two Capita contracts. We have also been told that Barnet is working hard at bringing down agency costs. Unfortunately that isn't work as well as planned and after an initial drop in payments to Comensura they have started climbing again. 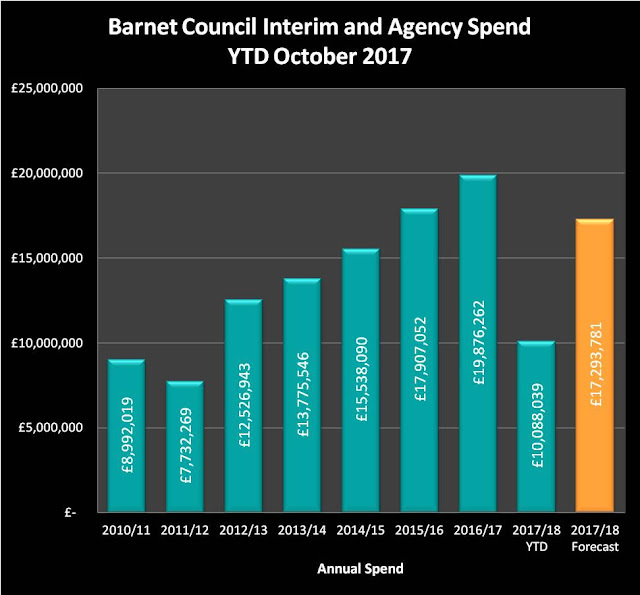 In October Barnet paid Comensura £1.853 million bringing the running total for the year to £10.88 million with a year end forecast of £17.3 million. There are a few other payments which caught my eye, although given that this month's expenditure spreadsheet ran to over 12,400 separate payments I have probably missed something more interesting. Blue 9 Security are doing nicely out of the library work billing Barnet £78,599.69. This brings the running total for the seven months of this financial year to £625,647.68. To set that in context in 2015-16, before the unstaffed library process began, they billed £662,949 for the entire year. The council spent £9,600 for events at the Ariana Banqueting suite conveniently located on the North London Business Park - I wonder where they will use when the council offices move to Colindale. There are also over £1.1 million of redacted payments classified as "various" from "various" departments. Not helpful or transparent. So are we getting value for money from the outsourced Re Contract? On Tuesday 28 November we have a meeting which will discuss the review of the Development and Regulatory Services contract with the Capita Joint Venture, Re. I have read the report and the numerous appendices and it makes uncomfortable reading. Some services such as Trading Standards and Environmental Health are okay, others such as Highways and Planning are problematic. "The RE contract is a wide-ranging and complex commercial structure, which has created challenges regarding interpretation and understanding. The review has been particularly beneficial in terms of securing better awareness of this structure and thereby resolving a number of matters relating to interpretation and understanding of various elements of the contract." What this says to me is that they didn't understand the contract when it was signed and even after 4 years of this contract being in operation they are only now coming to terms with interpretation of the contract which to my mind is unforgivable. "There have been significant issues on highways service delivery, which is in part due to the complexity of the arrangements between RE, Conways and the Highways DLO." I have said repeatedly that the complex contractual relationship means that certain tasks fall between the gaps at the contractual boundaries and that is bad for residents. The Planning Committee may wish to consider the policy in terms of the extent of consultation". Good recommendations but the fact that we are 4 years into this contract shows that the monitoring system has been inadequate to date. I blame all those professional consultants and lawyers who were paid millions to set up this contract but have so clearly failed to consider how it would be implemented. "Capita’s internal organisational structure (known as “the towers”) has been identified as a layer of complexity that potentially impacts on day to day service delivery and a further exploration of this is recommended (report will include specific examples)"
Talk about "silo mentality" to anyone in business and they will tell you how destructive it can be for an organisation yet Capita seem to foster and promote this through their "Towers". Again this is something that should have been identified and addressed much earlier. The key risk now is that while it has been identified Barnet have no ability to influence how the much larger Capita organisation operate and as such they are likely to remain in place. "Our benchmarking identified that a clearer understanding would be achieved if margins and costs were considered in relation to prices charged for service delivery". In other words we don't know if we are being ripped off! "In addition to the core contract, there is substantial expenditure on projects and the Review brief anticipated that the Review would pay some attention to this aspect. However, timelines have not permitted detailed reviews of individual projects, so the focus has been on value for money. Despite the use of external support, it has proved difficult to obtain sufficient information to conclude whether or not overall project costs represent good value for money and it is proposed that officers should explore this further". Again, the issue of the cost of special projects is something I have been challenging for the last four years. I challenged on the CSG contract and it was brushed aside. Now they are saying they can't tell whether projects are value for money. In any other organisation any senior manager making such a statement would either be demoted or sacked. In Barnet they just accept it and say officers ought to explore it further - pathetic! There is no mention of a number of issues which I raised as part of my submission and which I know other people have concerns about such as the transparency of the contract and who in Re is responsible for each service. The Council has a large chart with names, emails and phone numbers for key senior council staff but not a single person within the Re or CSG contracts is included. That makes them faceless and it frustrates residents when they seem unable to get through to the people who can resolve problems and get things done. There is no mention of the financial performance of this contract. Given that it is overly dependent on raising money rather than making savings ,understanding how well it is performing is critical. The big risk is that in the absence of revenue generated from new business, Re simply put up prices to Barnet residents. The report notes that Barnet had one of the highest set of charges for pre planning advice of any of the comparator boroughs. We also have the highest charges for pest control and second highest for vehicle crossovers. So when Barnet say this contract is saving money remember we are generating those "savings" through the higher prices we are paying. I have submitted a series of questions to the meeting which I have set out below. It will be interesting to see how they respond. Appendix A says “The contract is on track to deliver significant savings to the council, in the order of £39m over the 10-year term”. However the external auditor stated in the audit completion report that there was an under performance of contracted income for the past two years totalling £4.599 million and that this was unbilled by Barnet. In addition, the Partnership Director from Capita said that he "acknowledged the disputed £4.6 million" but that would be subject to debate. Are you sure this report is an accurate reflection of the true financial performance of this contract and why did this shortfall only come to light in the audit report. When the report says “in the order of £39 million” why is it so ambiguous. Is it more or less than £39 million and if less, by how much? What is “reasonable quality” and is reasonable good enough? A prepayment of £16 million generating a discount is not a service improvement. Why has it been categorised as such? The report states that “the review has been particularly beneficial in terms of securing better awareness of this structure and thereby resolving a number of matters relating to interpretation and understanding of various elements of the contract”. If it has taken you 4 years to interpret and understand this contract is that a success or an admission of failure? Under regeneration, please can you clarify what are the “ongoing disagreements about what services are covered by the management fee”? In Appendix A the report states “it has proved difficult to obtain sufficient information to conclude whether or not overall project costs represent good value for money”. In particular the Impower report notes that there may be a benefit in looking at alternative suppliers of project resources especially firms like supplier D. Why has it taken 4 years to discover this. The reports states that “contractual commitments have been reviewed and the majority have been delivered” In my submission I identified 132 contractual commitment s and have not seen evidence that they have been delivered. Has this committee been provided with evidence that they have been delivered? In Appendix C the number of customer satisfaction responses in 2014/15 was 1101 but in 2016/17 was only 162. How confident are you that the data is representative given such a small sample size and why was a larger sample not sought? In Appendix D the levels of customer satisfaction in 2015/16 fell by 10 percentage points compared to the previous year. The explanation of the 2016 figure implies people are unhappy because applications have been refused. Does this mean that the level of refusals is up on the previous year or is it simply an excuse for falling performance. In Appendix E the report notes that contractual commitment T3-100 has only been partially completed even though the commitment should have been completed by December 2013. Do you think a commitment that is 4 years overdue is acceptable? In Appendix E the report notes that contractual commitment T3-110 has still not been completed even though the commitment should have been completed by September 2014. What service credit has been levied for this non compliance? In Appendix E the report notes that contractual commitment T3-112 is not due. However the contract says this commitment was due 12 months after the contract was signed. Please can you clarify why this commitment has been incorrectly labelled as not due? In Appendix F the report notes that three contractual commitments T3-091, 097 & 098 are still not complete even though they should have been completed within 1 year of signing the contract. Why? Given that there is a clear disconnect between the service that was defined by the output specification and KPIs at the time and the council’s current requirements, does this mean that the service specification will be changed, will there be additional costs and does this exemplify the problems of trying to specify such a complex service over such a long contract period.